Senator Tony Hwang represents Connecticut’s 28th Senatorial District, which includes the towns of Fairfield, Newtown, Easton, Weston and Westport. He lives in Fairfield with his wife, Grace, and their children, Christina and Peter. Tony and the rest of his family eventually moved to Watertown, NY where they lived in a federal housing project. Tony took English as a second language (ESL) classes and benefited greatly from what he described as “passionate, caring teachers and administrators” in the public school system. Tony also received invaluable support from the Upward Bound educational assistance programs, sacrificing Saturdays and summer vacation to receive instruction and coaching. Tony graduated with a Bachelor’s Degree in labor relations and organizational behavior from Cornell University. After working briefly with United Technologies, he entered the executive search business, ultimately founding his own company recruiting technology executives. For the past several years, Tony has been involved in residential real estate. Tony’s commitment to public service began in 2005 when a town educational issue motivated Tony to run for and win a position on the Fairfield Representative Town Meeting. In 2008, concerned about CT’s fiscal accountability and struggling environment for jobs and businesses, Tony ran for and won the State Representative seat representing the 134th district representing Fairfield and Trumbull. He quickly established a track record of what he termed “fiscal responsibility, moderate and responsible social views and an unwavering passion and commitment” to his community. In 2010 and 2012, Tony was re-elected again by double-digit margins with bipartisan voter support. 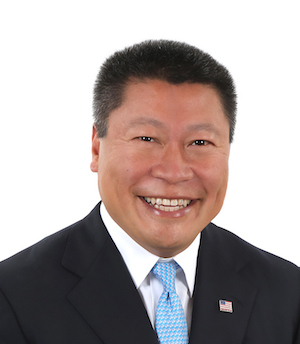 In 2014, Tony became the first Asian-Pacific American State Senator in Connecticut history. As an Assistant Republican Leader in the Senate, Tony has worked hard with his colleagues on both sides of the aisle, and with his constituents, to created policies and programs that protect Connecticut’s most vulnerable residents and provide opportunity for all communities, and he has held a hard line when the Governor sought to take away their funding. Tony has worked with numerous local nonprofits including the Kennedy Center, specializing in caring for those of the autism spectrum, and the Center for Family Justice, that works to provide counseling and assistance to victims of domestic violence. Tony has also received awards and commendations by organizations such as the Connecticut Alliance of YMCAs for his work with local youth, the League of Conservation Voters for championing environmental stewardship, AARP for his steadfast support for seniors, the Uniformed Professional Firefighters Association for his unwavering advocacy on their behalf, Mothers Against Drunk Driving (MADD) for his support of their efforts, and the CT Council on Problem Gambling for upholding their values in the legislature, among others.